Pasta is wonderful and all, but it doesn’t fit into my no-wheat diet. Pasta is one of those carbs we could probably do without. However, if you/I must eat it, whole wheat pasta is best. Now spaghetti squash has thus far been my favorite pasta substitute, but it can get boring. Recently, zucchini noodles, or ribbons, peaked my interest. I’m all for more ways to incorporate veggies into my diet! 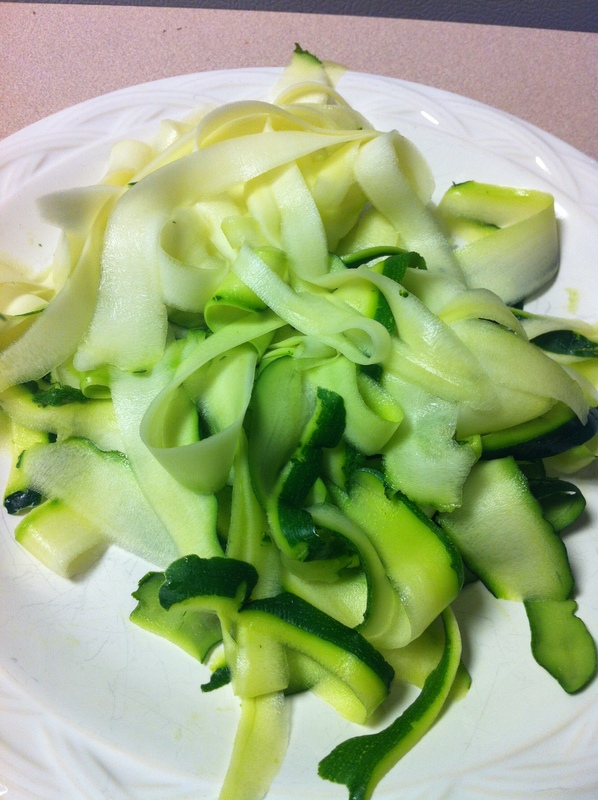 I was pleasantly surprised at how easy it is to make zucchini noodles (or ribbons, as mine turned out.) Simply wash the zucchini, run it over with a vegetable peeler or mandolin, cook the ribbons in boiling, salted water for 2 minutes and they’re done! I found a simple tomato sauce recipe (here) to pair with the zucchini that I’d like to try in the near future. I love using zucchini instead of pasta! And you’re right; it is fantastic with tomato sauce, a little grated parmesan and hot pepper flakes.